Position rack in the middle of oven and preheat to 400 degrees F. Grease a 9 x 13 inch baking dish or coat with spray. To make the pastry: in a large bowl stir together the flour and salt. Add the shortening. Using a pastry blender or your fingertips, cut in until the mixture resembles coarse crumbs. Stir the almond extract into 3/4 cup of ice water. Drizzle this over the flour mixture. Toss with a fork or mix with your fingers until well incorporated and the mixture holds together. If needed, add a bit more ice water a tbsp at a time over the mixture until it holds together when pressed with your fingertips. It should not be dry. Knead until smooth. Divide dough in half. Shape dough portions into 3 x 8 inch logs. Roll out one of the dough logs between sheets of parchment or waxed paper until 12 inches wide and about 12 1/2 inches long. You may have to patch the dough to make the edges of the rectangles even. Roll out any creases on the underside of the dough. Peel off the top sheet of paper gently, then pat back into place. Flip the dough, and peel off the bottom sheet. Trim if necessary, to remove uneven edges. Using a sharp knife or a pastry wheel, cut the dough in half lengthwise and crosswise to form 6 inch squares. Repeat the process with the second dough portion. To assemble the Apple Bundles peel the pastry squares from the paper one at a time and lay on a clean sheet of parchment or waxed paper. Center a portion of the apple mixture up in the center of each pastry square. Sprinkle 2 tbsp of brown sugar on each and top with a piece of the butter. 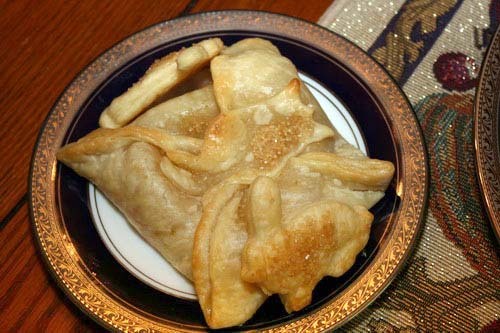 Put more apple on top and pull the 4 corners of the pastry up and around the apple filling. Pinch the 4 seams together firmly so the apple is secured within. Trim away excess dough from the sides. Repeat with the remaining pastry and apples. Arrange in a baking dish. You can use dough scraps cut into simple shapes to decorate the top of your bundles. Using a pastry brush, evenly brush each of the bundles with milk. Bake for 40 to 45 minutes or until the bundles are browned and the apples are tender when pierced with a fork. Cover with foil if you notice the dough is browning too rapidly during the final 10 to 15 minutes of baking (also, sprinkle with some Demerara sugar for an extra special effect) . To make the sauce, stir together the brown sugar, hot water, butter, lemon juice, Apple Brandy or Apple Juice along with the cinnamon in a 2 quart saucepan. Stir over medium heat, bringing to a gentle boil. Continue to boil gently, stirring occasionally, for 3 minutes. Remove from heat and stir in vanilla. The sauce will be of a thin consistency. Drizzle half the sauce over the bundles as soon as you remove them from the oven. Allow them to stand for an hour prior to serving. Place the remaining sauce in a small dish to serve with the Apple Bundles.